Vincent Willem van Gogh (March 30, 1853 – July 29, 1890 ) was a Dutch artist. His paintings and drawings include some of the world's best known, most popular and most expensive pieces. He is the archetypical tortured artist. Van Gogh spent his early life working for a firm of art dealers and after a brief spell as a teacher, became a missionary worker in a very poor mining region. He did not embark upon a career as an artist until 1880. Initially he only worked with somber colors, until an encounter in Paris with Impressionism and Neo-Impressionism, whose brighter colours and style of painting he developed into a uniquely recognizable style, which was fully developed during time spent at Arles. He produced more than 2,000 works, including around 900 paintings and 1100 drawings and sketches, during the last ten years of his life. Most of his best-known works were produced in the final two years of his life, during which time he cut off part of his left ear following a breakdown in his friendship with Paul Gauguin. After this he suffered recurrent bouts of mental illness, and committed suicide. The central figure in Vincent van Gogh's life was his brother Theo, who continually and selflessly provided financial support. Their lifelong friendship is documented in numerous letters they exchanged from August 1872 onwards. Van Gogh is a pioneer of what came to be known as Expressionism and had an enormous influence on 20th century art, especially on the Fauves and German Expressionists. On 27 July 1890, aged 37, Van Gogh is believed to have shot himself in the chest with a revolver (although no gun was ever found). There were no witnesses and the location where he shot himself is unclear. Ingo Walther writes, "Some think Van Gogh shot himself in the wheat field that had engaged his attention as an artist of late; others think he did it at a barn near the inn." Biographer David Sweetman writes that the bullet was deflected by a rib bone and passed through his chest without doing apparent damage to internal organs—probably stopped by his spine. He was able to walk back to the Auberge Ravoux, and there was attended by two physicians; however, without a surgeon present the bullet could not be removed. 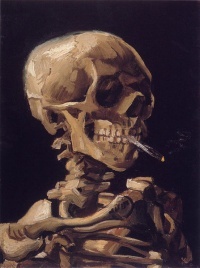 After tending to him as best they could, the two physicians left Van Gogh alone in his room, smoking his pipe. 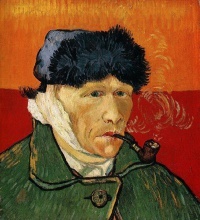 The following morning (Monday), Theo rushed to be with Van Gogh as soon as he was notified, and found him in surprisingly good shape, but within hours Van Gogh began to fail due to an untreated infection caused by the wound. Van Gogh died in the evening, 29 hours after he supposedly shot himself. According to Theo, his brother's last words were: "The sadness will last forever." Since his first exhibitions in the late 1880s, Van Gogh's fame grew steadily among colleagues, art critics, dealers and collectors. After his death, memorial exhibitions were mounted in Brussels, Paris, The Hague and Antwerp. In the early 20th century, the exhibitions were followed by retrospectives in Paris (1901 and 1905), and Amsterdam (1905), and important group exhibitions in Cologne (1912), New York City (1913) and Berlin (1914). In his final letter to Theo, Vincent admitted that as he did not have any children, he viewed his paintings as his progeny. Reflecting on this, the historian Simon Schama concluded that he "did have a child of course, Expressionism, and many, many heirs." Schama mentioned a wide number of artists who have adapted elements of Van Gogh's style, including Willem de Kooning, Howard Hodgkin and Jackson Pollock. The French Fauves, including Henri Matisse, extended both his use of color and freedom in applying it, as did German Expressionists in the Die Brücke group. Abstract Expressionism of the 1940s and 1950s is seen as in part inspired from Van Gogh's broad, gestural brush strokes. In 1957, Francis Bacon (1909–1992) based a series of paintings on reproductions of Van Gogh's The Painter on the Road to Tarascon, the original of which was destroyed during World War II. Bacon was inspired by not only an image he described as "haunting", but also Van Gogh himself, whom Bacon regarded as an alienated outsider, a position which resonated with Bacon. The Irish artist further identified with Van Gogh's theories of art and quoted lines written in a letter to Theo, "[R]eal painters do not paint things as they are...They paint them as they themselves feel them to be". 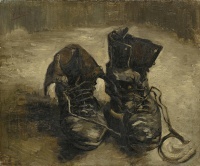 An exhibition devoted to Vincent van Gogh's letters took place in the Van Gogh Museum in Amsterdam from October 2009 to January 2010 and then moved to The Royal Academy in London from late January to April. Unless indicated otherwise, the text in this article is either based on Wikipedia article "Vincent van Gogh" or another language Wikipedia page thereof used under the terms of the GNU Free Documentation License; or on original research by Jahsonic and friends. See Art and Popular Culture's copyright notice. This page was last modified 09:50, 28 February 2016. This page has been accessed 10,952 times.